Purchasing power is steadily skewing towards Millennials and Gen Xers and so are customer experiences. These social media influenced, smartphone toting generations have distinct shopping behaviors that are a clear departure from those of the previous generations. They’ve grown up in a digital world and they have made their preference for online shopping pretty clear. A study conducted by the Food Marketing Institute and Nielsen predicts that online groceries will capture 20% of total grocery retail by 2025 to reach $100 billion in consumer sales. So, you have to go online or you will soon find your digital native customers leaving you in droves, because they will want to try the convenience of online shopping. If you won’t provide it, they will find someone else who will. You’ve made the move to online, what next? Now you’ve made the move to online – maybe you’ve got your ecommerce site up and running and maybe you even have a mobile app. Is this all that’s needed? The answer is a no, especially when this is what you are up against. Now all online groceries may not have the deep pockets and resources that Amazon does, but that does not mean you cannot offer best in class experiences to your customer. By focusing on overcoming a few concerns you too can take advantage of the online marketplace. We’ve rounded up what we think are the most important of these pain points. Delivering the right product to the right customer at the right time may sound easy but in reality, it requires a fine balance demand planning, response and execution. More so when you are selling online because the lack of product availability are more glaringly visible to the online consumer. To get the balance right, forecasting and planning needs to be done on a much more granular level. However, online buying patterns are more erratic and online groceries may find it hard to predict using traditional or readymade algorithms. Machine learning based systems, with their superior predictive capabilities can help grocers get their demand estimates right, automate replenishment and avoid stockouts. Today’s customer needs their shopping experiences to feel personal. Many are not too hung up on brand names and may in fact prefer artisanal products. Organic and freshly sourced produce is another big seller. Others may prefer convenience and ease of use above all. With such fluctuating behavior, how can you offer them a personal experience at your online store? Brick-and-mortar stores have already started offering meaningful experiences powered by machine learning enabled clienteling solutions. There is no reason why the same will not work for online groceries. Big data can help you consolidate transactional data from both online and offline modes of purchase. Integrate decision trees and machine learning to help you predict future shopping patterns. With all these working quietly under the hood you can offer your customer an experience that is personal yet not too creepy. Inventory management, always a key factor in improving revenue and maintaining customer satisfaction in the retail industry is more so in online groceries. For most customers who make the switch to online grocery shopping, high availability is an important prerequisite. To deal with this, online groceries have to aim for an availability greater than 99% on their complete assortment. But this exponentially increases risks because perishable and temperature sensitive goods form a major chunk of their inventory. Proper product availability and pricing will decide whether you win at online sales. 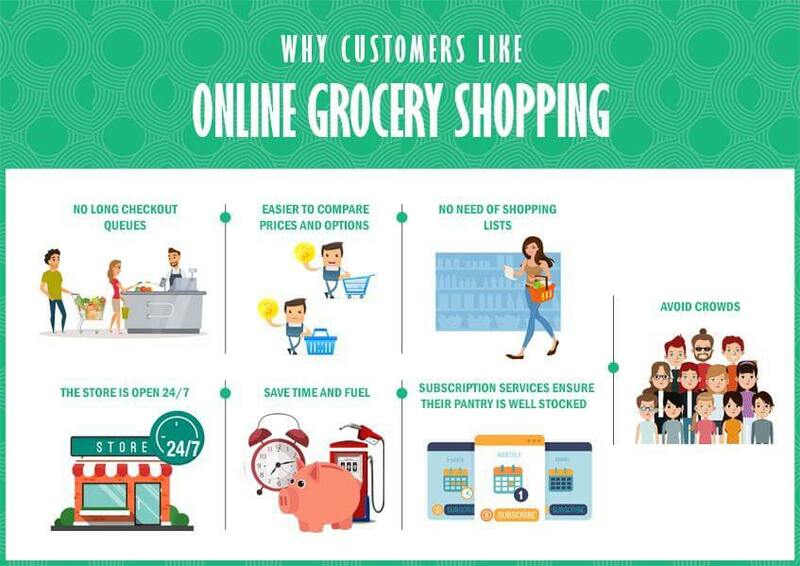 Customers may opt to have their groceries delivered or they may prefer to 'click and collect'. You need to converge the inventory of both your physical and online stores to ensure omnichannel success. The actual sale can happen online or in your store and you need to be prepared for both these scenarios. With its real-time analytical capabilities, the IoT seems like a logical choice for online groceries looking to maintain inventory accuracy. Also, unlike with brick and mortar stores, online orders can be placed at anytime. This means that you will need access to real-time inventory information 24/7 and on the go. Mobile merchandise & inventory management solution like InStore can help you view real-time inventory information and manage your store operation through an intuitive interface while on the go. Droids and drones maybe the future of delivery but most stores till depend of more traditional methods and these need to be tracked. Online shoppers always want to know where their order is at any given point in time and that their order is being transported to them safe and sound. They also like to track the delivery- when it was packed, when it was shipped and the expected time of delivery. If you are conducting your business online you need to be able to offer drill down transparency in transportation and tracking. This is all the more important for online groceries as they have to offer same-day delivery by default. Factor in cold chain and other perishables and you have a challenging scenario. IoT based Real-time or live fleet tracking can help online stores avoid the confusion and chaos often associated with last mile delivery. The IoT can also come into play with route optimization, vehicle maintenance and driving pattern analysis and most importantly cold chain monitoring. Your customers need to feel secure while making an online transaction, especially with identity thefts and data breaches becoming increasingly common. If your customers feel even slightly exposed to risk the odds of them returning are slim. Online groceries can make their customers feel safe by ensuring that all data is stored on a highly secure server, encrypting all entry points, including a firewall, preparing threat response strategies well in advance and conducting regular internal and external audits. Another way to ensure your customers security is by using SSL bank level security from trusted vendors on all certificates. Make sure that your employees are aware and up to date about current threats and encourage them to report any suspicious transactions.